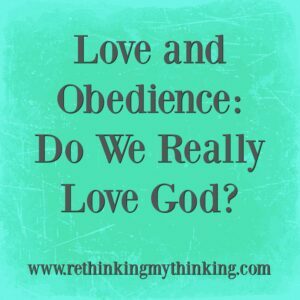 Love and Obedience: Do We Really Love God? When madly in love a man will bend over backwards to do what pleases his woman. He will write poetry, buy flowers, and even watch NCAA basketball for a whole day even though basketball is not his thing (thanks honey!). In fact when in love we seek to serve, please, and bring joy to the person we love. We study the person we love to find out their favorite soda, how they like their coffee, etc. We long to make that person smile and we talk with that person for hours or just sit with them near us enjoying life. Why then do we act differently toward a God we say we love? We would rarely not answer a text or phone call from the one we love, but we rarely open God’s Word to hear Him speak to us. We would never go a whole day without talking to the one we love, but sometimes days slip by without spending time in prayer. If we spoke to the one we loved on earth the way we spoke to God we would be embarrassed. We often only pray when we need help and rarely do we spend time telling Him why we love Him. We would never constantly do things that irritate or aggravate the one we love. Yet daily we do not keep God’s commands, we speak harshly, act ugly, pridefully ignore God as we live for ourselves and not for Him. Perhaps we don’t love God as we should? Once we give our lives to Jesus so He is the “boss” of our lives, God brings us from spiritual death to life on the basis of Jesus’ sacrifice. We ought to not only say we love God, but we must show we love Him. May our lives bring God glory and joy as we show Him we love Him, but doing what He says. Father God too often I say I love You, but I act like I really love myself. Forgive me for not doing the things that bring You joy. Help me to please You in my words, deeds, thoughts, and attitudes. May my life bring You glory and honor at all times. In Jesus’ Name I pray, Amen.